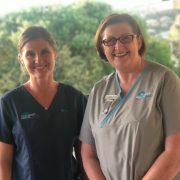 Cassie is our full time Nurse providing all clinical services as well as extra training for Teen Clinic, Sexual and Reproductive Health, including insertion and removal of Implanon and cervical screening. Cass is our Teen Clinic Nurse on a Thursday. Beverley has moved from the lower Blue Mountains and is working part-time at Main Street Medical Centre. Her focus is on Chronic disease management, Women’s Health including cervical screenings but she enjoys all aspects of practice nursing. Bev is our Teen Clinic Nurse on a Wednesday.